By Rachel Held Evans, on November 14, 2013. So I’ve heard from more than a few of my Reformed brother and sisters that I have a bad habit of painting the Reformed tradition with a broad brush (especially when I’m disagreeing vehemently with more conservative groups like the Gospel Coalition!). So I figured since we’ve already featured Justin Taylor for “Ask a Calvinist…” it was time to interview someone from the more progressive end of the Reformed spectrum. And I think we found the perfect interviewee. The Reverend Jes Kast-Keat is a Minister of Word and Sacrament in the Reformed Church in America. 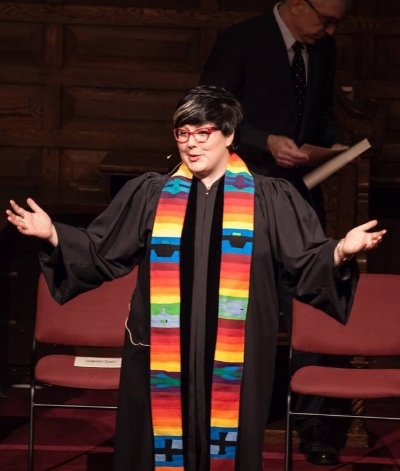 She currently serves as the Associate Pastor at West End Collegiate Church in Manhattan. Roman Catholicism and American Evangelicalism influenced her while growing up. It wasn't until seminary that she encountered the Reformed Tradition and fell in love with a wide stream of robust theological thinkers and vibrant spiritual leaders. She is originally from Michigan and has lived in New York City for the past three years. While theology makes her heart sing, you will also find Jes enjoying a show on Broadway, sitting in Central Park with the poetry of Mary Oliver, or hitting up a concert. Jes is one of the twelve voices that writes for "The Twelve. Reformed. Done Daily" which is a collaborative project of diverse theologically Reformed voices. Her theological inspirations include John Calvin, Serene Jones, Oscar Romero, Teresa of Avila, and the countless everyday theologians who ask questions and "ponder anew what the Almighty can do". Preaching the grace of God and administering the sacraments is what gives life to Jes. You can follow her on Twitter here. If you have a question for Jes, leave it in the comment section. Please take advantage of the “like” feature so we know which questions are of most interest to readers. At the end of the day, I’ll choose 6-7 questions to send to Jes for response. You can look for the follow-up with her responses in about a week. Check out the other interviews in our “Ask a…” series here.